This plugin can be used to display images, mp3, mp4, flash, YouTube, Vimeo, Viddler videos in a lightbox popup. It can also be used with videos hosted on your Amazon S3 account. A lot of users of our free WordPress Video Lightbox plugin requested us to develop a more powerful and professionally supported lightbox plugin so here it is. The the WP Lightbox Ultimate plugin has many customization options and can handle many types of videos that the WP Video lightbox plugin couldn’t handle. Videos embedded with this plugin will impress your visitors! Please click on the following links and it will take you to a page where all the different types of media files have been embedded using the WP Lightbox ultimate plugin. Easy installation and setup – it takes minutes to install the plugin then embed your videos with shortcodes. Embed videos anywhere on your WordPress site with lightbox effect using shortcodes. Give your sales and landing pages a fresh look with professional looking lightbox effects with this plugin. Videos embedded using lightbox effect take less space on your landing page regardless of the dimensions of the video. This will help you efficiently manage the real estate on of your landing pages. Embed media files using an anchor text or an anchor image (the lightbox pops up when the text or image anchor is clicked). We have shortcodes that will allow you to embed videos that are responsive and works on all browsers. Embed mp4 videos (the most popular video format for web) using lightbox effect that works on all major browsers (including iOS devices). You don’t have to worry about some of your users not being able to play the video. Use lightbox effect on YouTube videos (single video or a playlist). You can also embed Vimeo and Viddler videos using lightbox effect. You can embed videos from your Wistia account. The Wistia videos will play in a lightbox/overlay window. Embed the following media types with lightbox effect: images, mp4 videos, mp3 audio files, PDF files, flv, flash (swf), f4v etc. You can use any MP4 video file(s) that you have already uploaded to your WordPress media library and embed them on a page using a lightbox effect. Embed videos stored on your Amazon S3 account using lightbox. You can also embed private/protected mp4 videos stored on your Amazon S3 account to add protection for your videos (the videos will be responsive and work on all major browsers including iPhone and iPad). Very useful if you are selling videos. You can use this plugin to embed videos stored on your Google Drive account using the lightbox effect. 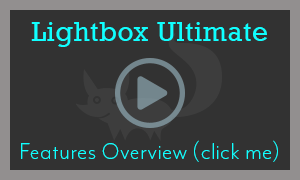 You can use this plugin to embed videos stored on your Dropbox account using the lightbox popup effect. Ability to create a secure download link on a WordPress page for your video files stored on your Amazon S3 account (this will allow your users to download the media file without compromising the security of the video file). Very useful if you are running a video membership site using a plugin similar to WP eMember. RTMP video streaming support using Amazon CloudFront and S3. WordPress allows you to create photo galleries by uploading images using the media uploader. Lightbox Ultimate plugin can extend that functionality and allow you to also open each of the gallery images using the lightbox effect. You can load another HTML page from your site in an overlay/lightbox popup using this plugin. We offer good customer support. Check out our customer only forum to see how we handle product related issues (usually within 24 hours). Click on the “Upload” tab then browse for the plugin file (wp-lightbox-ultimate.zip) that you received after purchase. Click the “Install Now” button and hit activate when prompted. Now go under the WordPress “Settings” menu and click on the “WP Lightbox” to access the settings menu of this plugin. If you face any issue with this plugin please post it on our customer only support forum and we will address it. This is an awesome plugin. You guys truly have the best set of plugins for internet marketers. The plugins are very nicely designed and packed with lots of useful features. Keep up the good work. 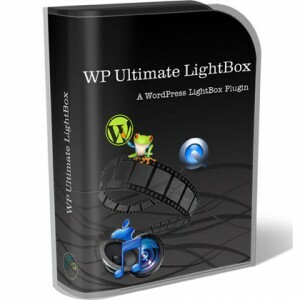 Get the WP Lightbox Ultimate plugin and upgrade the look of your WordPress site now! Like the WordPress Lightbox Ultimate Plugin? Why not sign up for an affiliate account and promote it to make some money? Please leave a comment below if you have any questions. @Dave, Lightbox Ultimate does have an option to open a MP4 video in lightbox. You can see it on our demo page.